In the first chapter of his book, “The Great Marriage Tune-up Book,” Jeffry H. Larson presents 10 myths about marriage. 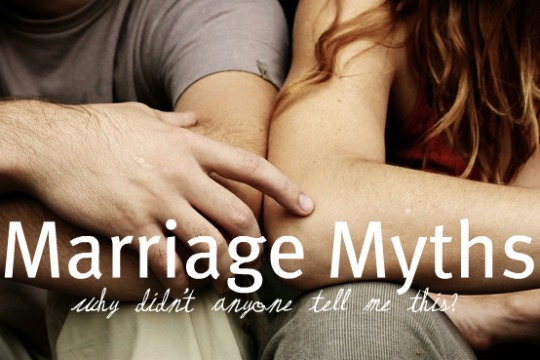 These myths, if believed, can sustain and even create problems in marriages. 1. If my spouse loves me, he should instinctively know what I want and need to be happy. No one is a mind reader. Your spouse will not be able to just automatically know what you want or need from them. The best thing you can do for your spouse is to clearly and respectfully tell them what you need. 2. No matter how I behave, my spouse should love me simply because she is my spouse. This is an excuse to not make changes in yourself. How you behave towards your spouse will ultimately determine how much they love you. If you strive to be kind, respectful, and loving towards your spouse, they are more likely to love you in return. 3. I can change my spouse by pointing out his inadequacies, errors, and other flaws. No one likes their flaws pointed out as we are all aware of our deficiencies. The more you nag your spouse about changing, the more it will become a power struggle, thus decreasing the chances change will occur. It is better to point out the good things your spouse does, as this encourages that preferable behavior to continue. 4. My spouse either loves me or doesn’t love me; nothing I do will affect the way she feels about me. This is another excuse to not make needed changes in yourself. It is best to act lovingly towards your spouse so your spouse will want to love you back. 5. The more my spouse discloses positive and negative information to me, the closer I will feel to her and the greater our marital satisfaction will be. Negative comments have much more effect than do positive ones. The ratio of positivity to negativity in happy marriages is five to one. This means for every one negative comment, you need to say at least five positive things to make up for it. So, it is better to focus on the positive things and only say something negative if it is necessary and remember to say it as respectfully as possible. 6. I must first feel better about my partner before I can change my behavior toward him. The best way to change your feelings toward your spouse is to change your behaviors towards him. If you act more lovingly towards your spouse your feelings of love will also increase. 7. Maintaining romantic love is the key to marital happiness over the life span for most couples. Romantic love is important, but for marriages to last companionate and altruistic love are also necessary. 8. Marriage should always be a 50-50 partnership. There will be times in marriage that one spouse cannot give equal input because of sickness, work, etc. It is best for couples to not keep a running score of who owes who what as this leads to unhappiness. Couples should always strive to give 100% of their efforts to making their marriage the best it can be. 9. Marriage can fulfill all of my needs. Marriage is the right place for many of your needs to be met. Some needs are better met by appropriate others. 10. Couples should keep their problems to themselves and solve them alone. Problems will arise in marriage. Some problems cannot be solved alone and are best solved by help from a clergy or marriage therapist before the marriage suffers too much from this problem. Being able to see past these myths allows individuals to look at their marriage from a realistic perspective. This permits individuals to see where they need to make changes in themselves to improve their marriage relationship with their spouse.